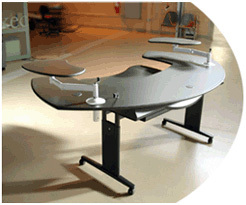 Our largest desk with motorized sitting-to-standing adjustment, including separate keyboard surface adjustment with tilt action. This is a premium, heavy-duty design featuring our trademark solid surfaces and Comfort Edges. Maxo is truly massive and ideal for power users with multiple monitors. Flexible layouts for professional, production and console applications. • 5 year limited manufacturing warranty.